It’s almost bedtime and you know the struggle that awaits you. You call out to your kids to brush their teeth and every day you meet the same resistance. If this scenario sounds familiar to you, then you know how difficult it can be to brush your child’s teeth. You may know that you need to maintain oral hygiene to avoid cavities and gum disease. But, your children are too young to grasp these concepts. Most children don’t enjoy brushing and resort to an onslaught of tantrums to avoid the daunting task. Evident from the 78.9% prevalence of dental caries in the six to eleven-year-old bracket, keeping teeth cavity-free is extremely challenging for parents. Have you ever had someone force something in your mouth? If yes, then you know it’s unpleasant and your child doesn’t like it either. However, young children can’t brush themselves. Hence, a parent has no choice but to brush their teeth for them. Believe it or not, many children refuse to brush simply because it’s boring. Children are full of energy and unless they are watching their favourite cartoon, it’s difficult to get them to stay still. From their perspective, expecting them to brush their teeth for 2 whole minutes is too much to ask. If your child simply won’t stop protesting, then it’s possible that he may have tooth sensitivity. Due to sensitive teeth, he or she may find brushing painful. Because they are too young, they may not be able to communicate this to you. If your child has trouble while eating or drinking something hot or cold, then it’s a sign that he/she suffers from tooth sensitivity. It’s never too early to start taking care of your children’s oral health. Start cleaning your child’s gums even before his/her teeth appear with a cloth or gauze. This will get your children used to the feeling of having their teeth brushed. Once the first tooth erupts, start using a toothpaste and toothbrush. Children have special needs and they need dental products especially catered to them. Child-friendly toothpastes like Kids Bunny have fruity flavours and lower fluoride content to better suit your little ones’ taste buds. Similarly, toothbrushes like Kids Dyny have smaller heads and cartoon-based handles to make brushing easier and fun. Kids like to copy what their parents do. You can encourage them to brush by making it a family activity. Since brushing isn’t easy for children, they take time to learn the ropes. When children watch their parents, it helps them learn how to brush properly. While you should brush your child’s teeth until they are 6-7 years old, allowing them to brush themselves will increase their comfort level and confidence. You can try purchasing more than one flavour of toothpaste to keep things interesting. Allow them to pick which flavour they want to brush with. This gives them some control over the activity and reduces the resistance. Make it clear that brushing is part of their routine and skipping it isn’t an option. A defined morning and evening routine will help them learn what is expected. Singing a song or reciting a story while brushing their teeth. Letting them have their favourite stuffed animal or toy while brushing. Turning it into a game by challenging them to brush for the entire 2 minutes. Keeping a ‘brushing calendar’ near the sink and award stars for every day your child brushes without making a fuss. Give them something special for 7 consecutive stars. If your child refuses to brush despite trying everything mentioned above, you will need to resort to harsher means. You can revoke their playtime or television privileges every time they don’t brush. This will eventually make them realize that resisting for a 2-minute chore isn’t worth the effort. Once your children grow older, they will understand the importance of regular brushing and take conscious efforts to maintain their oral hygiene. Till then, find a way that works best for your little ones and help them keep their mouths clean and healthy. 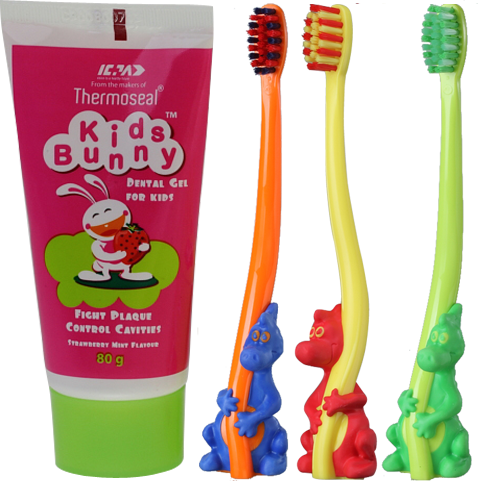 You can now purchase ICPA’s range of dental care products for children, Kids Bunny Gel and Kids Dyny Toothbrush, on amazon.in.